The Middle Ages are our destination now as we check out this Robin Hood-themed online slot from Rival Gaming. 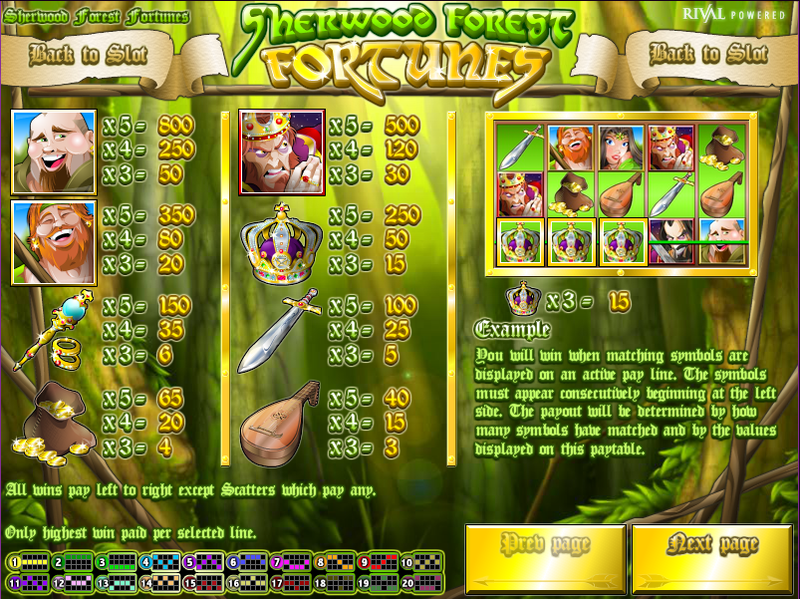 It’s called Sherwood Forest Fortunes and it’s part of Rival’s i-Slots range of games which should mean it has one or two added extras which lift it above the norm. All the basic elements of Robin Hood’s story are here so read on to find out more. 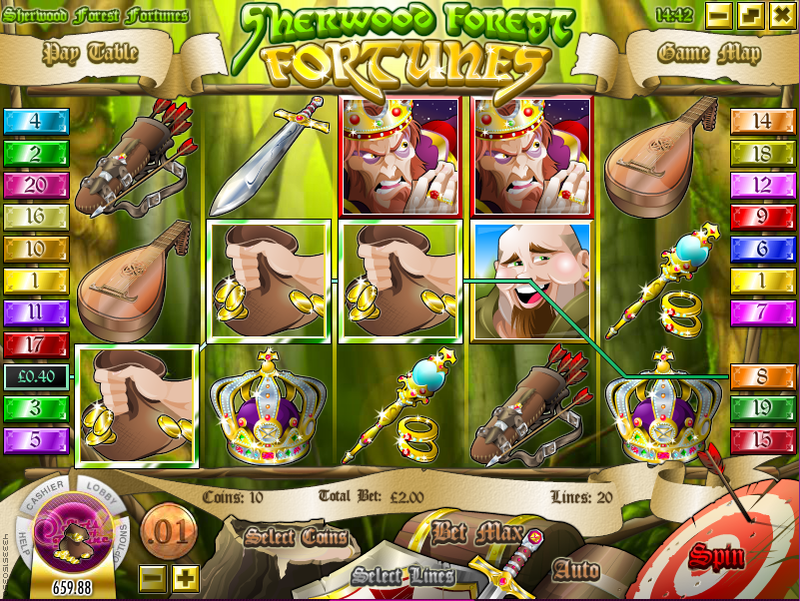 Sherwood Forest Fortunes is a five reel and twenty payline game set against the misty woodland background of the gigantic Sherwood Forest. The main symbols are largely as you would expect for this theme and include a lute, a sword, a bag of gold coins, a jewelled mace, Little John, Friar Tuck, a crown and King Richard. The Sheriff of Nottingham is the most valuable;e base game symbol. Special symbols include the Robin Hood wild and the Maid Marion bonus; a second bonus symbol is arrows in a quiver. The wild, which only appears on reels one, three and five, can appear stacked which means they can appear on top of each other. Any wins you land during this feature will be subject to a 3x multiplier. Like other games from the i-Slots range, this slot has a narrative which means that each time you trigger the bonus game by landing three or more of the quiver scatter symbols you will play a short game, hopefully winning some money in the process, after which the story will move on to a different section. As you can see from the video above, the second part of the story involves the tax collector and from there the narrative continues further but you’ll have to find that out for yourself. The first bonus game is a simple affair in which you, as Robin, must guide the arrow into the scarecrow for a coin win. These i-Slots games are certainly good but you do need to commit yourself to them to play your way through the narrative. They are of high quality though and well worth checking out.